He also promised that the US would "return Americans to the Moon" and would eventually send people to Mars. "I'm hereby directing the Department of Defense and Pentagon to immediately begin the process necessary to establish a space force as the sixth branch of the armed forces," Mr Trump announced, moments after he discussed US and German approaches to immigration . 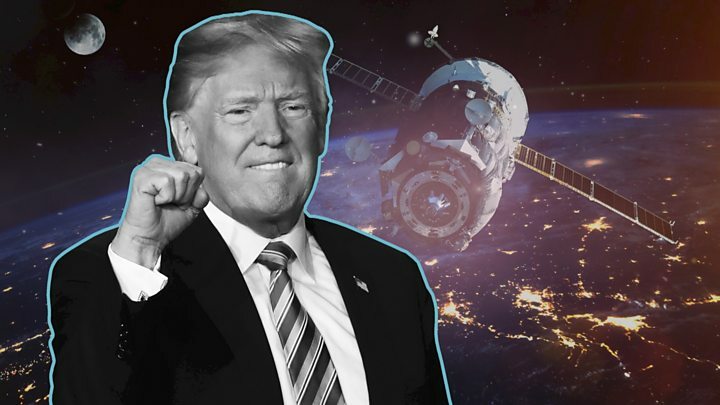 He also said it would be unacceptable to let either China or Russia lead in space, and he would be directing federal agencies to "implement a state-of-the-art framework for space traffic management". Details of what a new space force would look like and what it would do were not immediately clear. But Mr Trump said it would be "separate but equal" to the Air Force. The other US military branches are the Army, Navy, Coast Guard and Marine Corps. However, the US Congress would need to pass a law authorising it before any new branch of the military could be created. 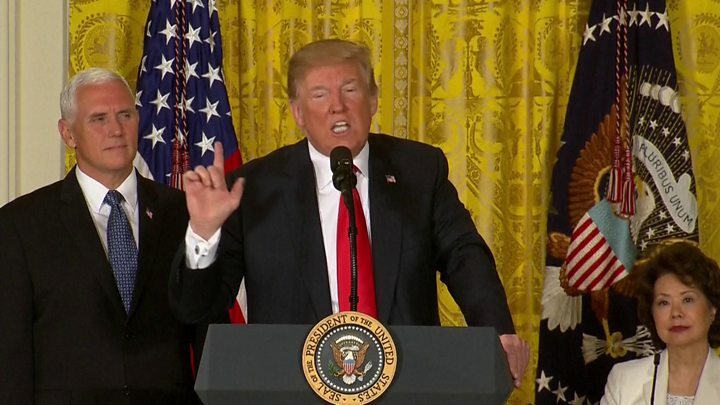 Speaking ahead of a meeting with the National Space Council, Mr Trump said, "This time, we will do more than plant our flag and leave our footprints. We will establish a long-term presence, expand our economy, and build the foundation for the eventual mission to Mars." The Trump administration would also embrace the budding commercial space industry, Mr Trump said, by allowing American "rich guys" to use US real estate to launch their rockets. "If you beat us to Mars, we'll be very happy, and you'll be even more famous," Mr Trump told the press conference, adding: "They can beat us and we're taking full credit for it." I stood across the East Room from Mr Trump during the event, "Moon, Mars and Worlds Beyond", and I could see he was enjoying himself - especially when he spoke of a "space force". Other people in the audience seemed surprised, though. People in the back of the room started to laugh, and others wondered aloud how Joseph Dunford - the chairman of the joint chiefs of staff and the man whom the president had just put in charge of the project - felt. Still, the idea's not completely new. The president has spoken on previous occasions about adding another branch, the "space force", to the armed forces. And a former US defence secretary, Donald Rumsfeld, once proposed the idea in 2000 (nothing ever came of it). Mr Trump's remarks in the East Room underscored his enthusiasm for the project, though, making it seem as though he'd return to the subject again.